Two months ago, the Nickelled leadership team sat down at our quarterly offsite in sunny Fuerteventura and made a big decision. With the business growing fast, we needed to add someone new to our team who could look after new clients. We’d been muddling along, but needed someone awesome who could bring knowledge, insight and structure to the role to help our customers hit the next level. We needed a customer success manager. As we’re now wrapping up our hiring process, we wanted to take a moment to share the three steps we went through to draft a customer success manager job description that would ensure we hired the right person for the role. After years working for big companies, I can tell you that too often, the minimum of thought goes into job descriptions. Lines or entire sections are reused, skills are copied and pasted, and the result is often more reflective of the internal processes of the company than of the job itself. We wanted to do things differently - so here are some thoughts on how to get the best candidates for this important role (companies with a dedicated Customer Success team have a 24 percent lower churn rate than those that don’t, according to Gainsight). We began by thinking about exactly what we wanted our ideal candidate to do. 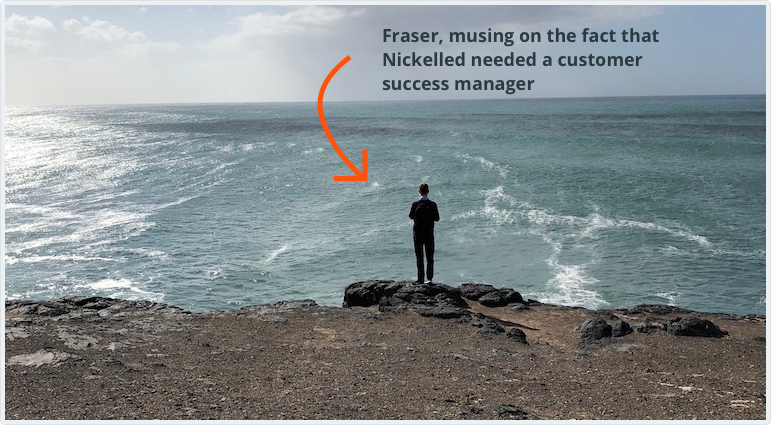 What will the customer success manager do and what won’t they do? First up, draft a paragraph that states what your customer success manager will do in the organization, and what they won’t do. It’s important that applicants know that they’re applying for a role with a tightly-defined scope so that they can draft the best possible application. This means knowing up front exactly what you’re expecting the person to do. 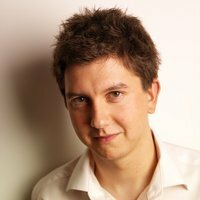 Customer success roles generally don’t include sales (occasionally, trial upsells will be included in a customer success manager’s remit, although it’s not standard) - most industry wisdom suggests sales should own sales and customer success should take over when the sales cycle is concluded. Inversely, many organizations prefer that customer success teams don’t handle technical support, especially when existing customer support structures are in place. If this is a requirement of the role, it’s worth being upfront around it, as some applicants may not be suited to support tasks. After defining what customer success ISN’T, think about what it IS. If you have a clear remit for the customer success team (e.g. increase upsells, reduce churn, improve retention) put that in - knowing what you’re aiming for will help candidates to align their own experience with your objectives. Nickelled is looking for a customer success manager who can own the entire post-sales success process (including first-line technical support for new users) to grow the business. 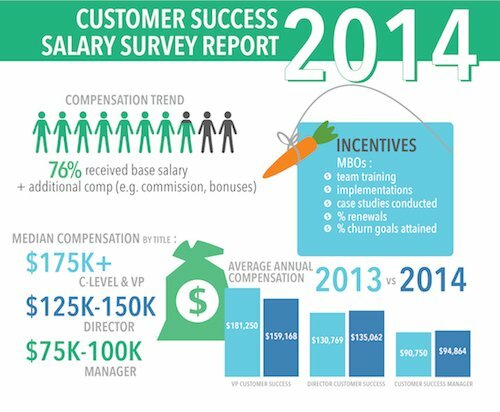 Where are you expecting the customer success manager to have the most impact? Customer success may be involved pre-purchase or post-purchase, with different KPIs (e.g. trial conversion vs reducing churn vs increasing upsell revenue). It’s unrealistic to expect a customer success manager to focus on all three equally, so think about the most important activities for your organization and ensure you’re setting expectations in the job description. Understanding the customer: How will the person be expected to get to know your customers as quickly and as well as possible? Intervention: At which touchpoints are you expecting your new customer success manager to interact with your customers most frequently? For instance, will they be most involved at the beginning of the relationship and fall back to reactive activity once a customer has onboarded? Or will they be expected to maintain relationships on a regular basis with all customers? Assistance: Is the customer success manager acting as front-line support, or are they more strategic in their account management, handing off support questions to another team while focusing on metrics such as adoption, active headcount or upsell revenue? Will they have the capacity to handle reactive support requests as well as forge ongoing relationships with all users? Our customers are central to our business and we’re looking for a customer success superstar who can own the entire post-sales relationship, including onboarding, ongoing retention and upselling. Through ‘get-to-know-you’ calls, email conversations and webinars with new customers, you’ll build strong relationships that persist through (and lengthen) the lifecycle of the customer. You’ll be the first point of contact for all of our customers, acting as the friendly face of our business and shepherding them to the right team to solve their problem. How will you measure and reward success for the role? It’s important to understand upfront what the potential ROI of your new customer success manager is — if you’re looking to improve trial conversion rate it may be a numeral, if you’re looking to increase customer satisfaction or experience it could be something less concrete. Either way, figuring out exactly the effect you’re expecting the position to have will be key to ensuring you find the right person. It’s increasingly unfashionable for customer success reps to carry quota, but large organizations may still tie salary to revenue metrics — most often, incremental upsell revenue (the increase in spend by a company throughout the year), gross dollar renewal rate (the percentage of spend that carries over from one year to another, negative or positive) or both. If compensation will work like this, be clear about it — some applicants may not want a commission/bonus based salary, whereas some may prefer it. Client-centric metrics: If you’re aiming for wider adoption within an organization (an increase in the number of seats or growth into other departments, for example), you’ll need to be able to track and measure stats like these. Don’t forget that client usage isn’t just about internal adoption though - it may also be worth tracking stats such as integrations with third-party tools or site deployments to gauge how reliant a business is on your product. Retention metrics: measuring stats such as 7/30 day retention or monthly active users by cohort can be a powerful way to track whether your customers are becoming more active with your product. 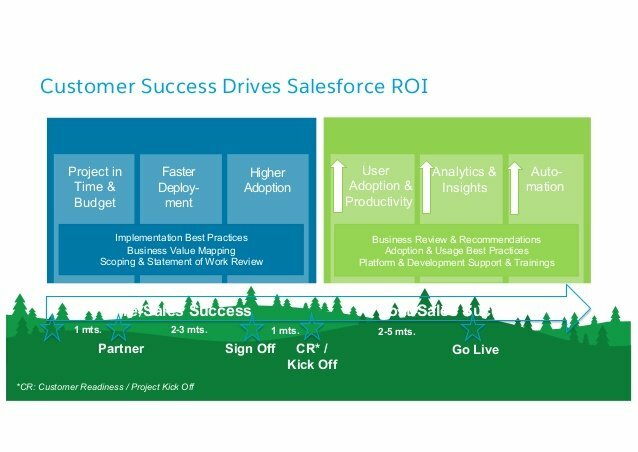 Engagement/adoption metrics: Customer success teams normally hold the key relationships required to make new product feature adoption a success, so measuring engagement activity (time on site, for example) or new feature adoption rates can be a good indicator of success. Customer feedback metrics: We’ve written about the pros and cons of systems such as NPS before (see here), but these metrics are worth keeping an eye on for sure. Great experiences breed great word of mouth — if you can measure customer satisfaction through NPS, other surveys, referrals, case studies or any other methodologies, you should. As a technology firm, we’re obsessive about numbers, and customer success plays a key role in what we measure internally. The customer success manager will own all upselling and current MRR, with a pay package linked to both of these numbers. But we’re not all about dollar values — equally important is feedback from our customers (measured through regular CSAT surveys). What else will the customer success manager be expected to do? The best customer success managers are cross-functional, and it’s best to highlight this expectation in the job description. At a minimum, the role should include working closely with the sales team to smoothly transfer ownership of a prospect who’s become a customer, and with the support team to ensure that problems are resolved to the customer’s satisfaction as quickly as possible. As the team members that are normally closest to users, customer success inputs into product discussions are often critical to building out a roadmap that’s as closely aligned to customer requirements as possible. In larger organizations, they may also need to liaise with other teams, such as finance (to reduce involuntary churn) or marketing (to co-ordinate on events, promotional materials, case studies or other customer-focused collateral). Some roles tend to fall to customer success no matter which team is doing the asking. The development and maintenance of the ideal customer profile (used by sales, marketing and product teams, among others), is often best accomplished by customer success. As the eyes and ears of the organization, a customer success rep will often also be required to comment/report on the quality of prospects converted by the sales team. You’ll work closely with teams from across the organization, helping to advocate on behalf of our customers to all of our teams. You’ll be responsible for making everybody else aware of their challenges, needs and concerns, whether that’s providing input on a new feature for the product team or offering feedback on the latest campaign to the marketing team. 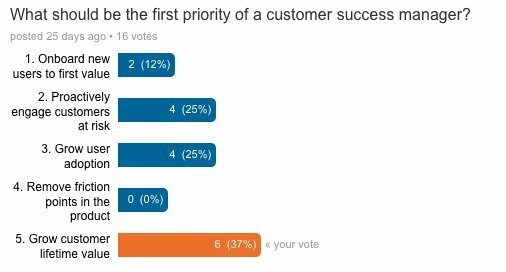 Who will the customer success manager report to? There’s some contention on this question, but for the sake of a coherent interview process, it’s worth spending some time thinking about. "It’s not super simple. There are generally 3 options in the early and middle days: CEO, VP of Sales (once you have one), VP of Something Else (finance sometimes, product on occasion, other “business” co-founder)." We’d agree with the analysis above — in our view, where possible it makes sense for the VP Sales to be responsible for customers end-to-end (Jason plumps for the CEO). Customers are at the heart of everything we do, and our organizational structure reflects that — you’ll report directly to our CEO. By following the guide above, you should have a relatively clear idea of what you want the first part of your customer success manager job description to look like - you’ll know the ins and outs of the role that you’re hiring for and what that person will need to do on a day-to-day basis. Now, it’s time to distill that down into a set of core competencies that your new hire will have to demonstrate (in the interview and the role) to succeed. In general, there is a reasonably clear set of things customer success managers need to be good at — the following is a comprehensive (but probably not exhaustive) list. You may need to tweak or re-order it to suit your requirements. This sounds obvious, but being customer-first isn’t easy. Good customer success managers can hold their ground when negotiating with a stressed support team, a hostile product management team or an angry finance team, safe in the knowledge that the work they do is vital for the growth of the organization. To be able to do that, they know their customers unlikely anybody else, becoming trusted advisors that customers see as true partners — able to deliver hard truths and believed to give unvarnished advice even when it’s not in their interest. Often, others in the organization will wonder whose side they are on! To get close to customers, your customer success manager needs to understand them — in particular, the mechanics of their business. Great CSMs act as consultants, taking time to understand the business realities and then working out the best way to reach the desired outcomes. For this reason, they’ll need more than a basic understanding of business, whatever industry you happen to be in, along with the vital consulting skill of being able to listen more than they talk. You’ll also want your customer success manager to apply those business skills inside your own business too — figuring out areas of improvement, ways that customer success can contribute more to the bottom line and which problems need to be tackled first to have the most significant impact. Our business runs on numbers, and we were looking for somebody who was comfortable in that world. Although it may not be the case for all business, most modern companies are sitting on a treasure trove of data that a strong customer success manager will be able to unlock to drive higher satisfaction in the organization. Check out our post on customer success analytics here for some examples of how CSMs can drive performance with numbers. 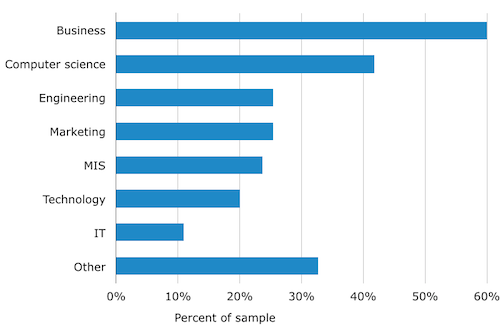 According to the above stats from Software Advice, computer science degrees are the second-most requested academic qualifications for customer service roles (the first is business) — with good reason. Having a strong technical background often isn’t a must, but can significantly speed up the onboarding of a new candidate — and it can make dealing with simple support questions a lot easier for them, subsequently reducing the strain on the broader team. If you intend to use your customer success rep for first-line support, technical skills will be even more important. We’ve always looked for some level of technical comfort in our team, just because it’s a lot easier to understand the sharp edge of a startup if you can delve into the basics of the code. This may not be a requirement for all companies, but given that customer success roles overwhelmingly exist in online SaaS businesses, it’s worth thinking about. Customer success roles are more than anything, about people. Your new employee’s fundamental job is to build relationships with customers and stakeholders, and they’ll be no good at it if nobody likes them. Too many companies make the mistake of hiring entry-level customer success staff — in our view, for a good CSM to display the skills above, they’ll need to have a few years of experience. Exceptional graduates notwithstanding, three to five years in a professional environment will help most people to deliver a more polished, professional experience than somebody who’s fresh out of college. Note that this doesn’t mean that they need to have a consulting background (or indeed, any particular background) — consulting seems like a popular career route into customer success, but it shouldn’t be a requirement. Instead, look for experience in handling customer queries, solving business problems, quickly picking up new tools or skills and strategic thinking. With the roles and responsibilities complete and the required skills in place, the final task is to pick a snappy job title. 'Customer success manager' seems to be the gold-standard for most companies, but we’ve increasingly seen the following job titles appear in the wild. Often, they give clues about what will be slightly different in the role — account managers may be quota-carrying, tasked with answering more day-to-day requests. Engagement managers tend to be assigned to larger organizations and may lead a team, as the business’s most senior point of contact for a given client.